If success is driven by location, Blue Hills Grille has it. Down Blue Hill Avenue from Boston and a bit south on Rt 138, after the Blue Hills ski spot in Canton but before you hit Rt 128, you're here. You go by it on the way to Canton center. Julie and I make a quick stop before we're off to class. So we're light, a generous pour of 2012 Harlow Ridge Chardonnay for Julie. Cutesy cocktails: lovely lady martini, Milton mocha, Canton cosmo and a bulldog margarita. A Mexican bulldog margarita comes with a bottle of Corona upside down. Is that it? No one at the bar has one, which is too bad. I might try it but beer and tequila? What's better than soup? Today it's onion. 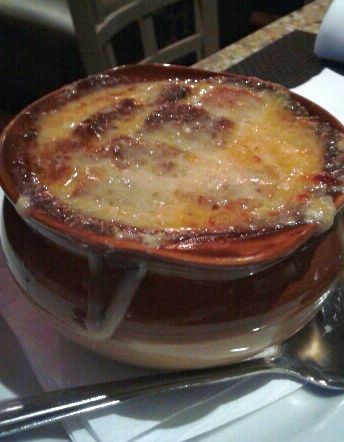 We cheer onion soup because of um, the cheese: Parmesan, Gruyère and no American. Atop a base of homemade beef broth, slow cooked Spanish onions, butter, sherry, thyme and bay leaves, crocked with croutons and finished in the oven. Could not be better. The bartender's not telling but we'll say, based on our own poll, it's the cheesiest. Drippy Gruyère tangles slurps, not the tap kind, nicely and Chardonnay takes a ride. If you're going to jump around in class, bread it up. The purist orders the burger, which shows up on the menu with four cheeses (hold), bacon (hold), onions (hold them too) and pickles (nope), mushrooms, which are okay, lettuce and tomato. Find it under the menu's 'sammiches' along with a burger of beans, 'house made and hand formed,' really? (The bartender says the menu's changing. I hope so.) No fries, no problem, they're happy to send out rice. This is as rare as you like, a rich blend, with char for that summer grill feeling. 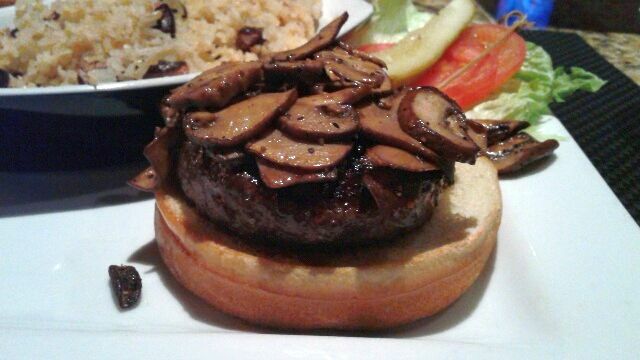 And someone marinated the mushrooms and dried them so they browned. Was it Julia? Such a treat not starving in class; must do this often. The menu leans bar American and if you're on a New Year's resolution, watch the steak and cheese eggrolls, wings, nachos and truffle Parmesan potatoes for starters. On down, there are salads. Mains: filet, steak tips, short ribs, fish and chips, and citrus vegetable quinoa. We're not sure what makes "adult mac 'n cheese" adult. What can it be? Is it the four cheeses? Why is it secret? Insert imagination here. Desserts are a brownie sundae and what looks to be big, big cheesecake with toppers. So much for good intentions. 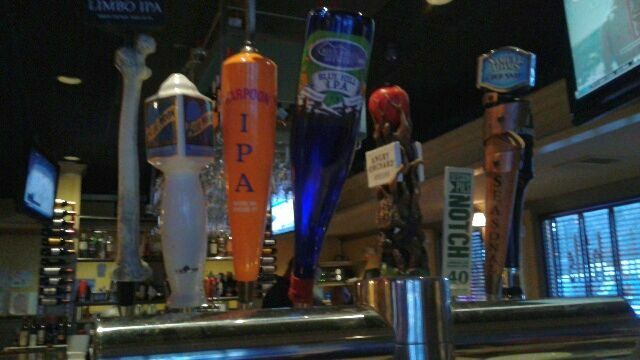 Beers on tap are many: the usual plus Guinness Irish stout, Slumbrew, Whale Tale, Allagash; West Coast Lagunitas and Green Flash and two ciders. 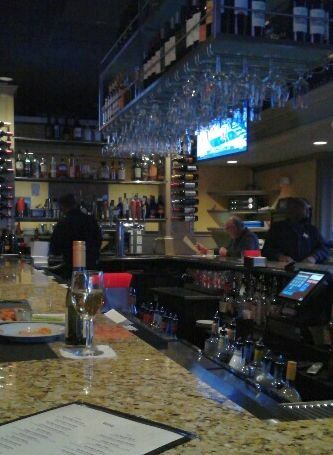 And the early after work crowd is loving every one at the 25-seat bar. Even in winter, nothing beats a cold beer. If it were closer to the studio, we could get the group in for a holiday party. Not sure if they will let us though. We've been known to close down a place ot two. And today's crowd is mellow. Perhaps it rowdys up later. It must.